Gitmo torturer allegedly had long history with Chicago Police Dept. The veteran police detective is reportedly the same Richard Zuley who became an interrogator of a high profile detainee at Guantanamo Bay as a US Navy reserve lieutenant from 2002-2004, according to a report by the Guardian. He is said to have exported his interrogation techniques. According to a memoir serialized last month in the Guardian, Guantanamo Bay detainee Mohamedou Ould Slahi said he was shackled for extensive periods of time, had his family threatened, was told to implicate others and was coerced into signing a false confession. Slahi was suspected of being a recruiter for Al-Qaeda. Zuley’s role in the torture of Slahi was also identified by blogger Jeffery Kaye from footnotes in a Nov. 2008 Senate Armed Services Committee report looking into the treatment of detainees. In Chicago, three current inmates and a former convicted prisoner are accusing Zuley and other police officers of similar tactics, including handcuffing them for hours and forcing confessions for crimes they did not commit. One of the inmates is Lathierial Boyd, who was exonerated by the Chicago’s state attorney’s office for lack of evidence in 2013 after he had served 23 years in prison. It is his federal civil rights lawsuit that charges Zuley with using illicit techniques to get him convicted. The Guardian identified three other people interrogated by Zuley who are still in state prison. According to the publication, the same state attorney that dismissed all charges against Boyd two years ago has reportedly agreed to review civilian complaints against former detective Zuley. Zuley, currently employed at the Chicago Department of Aviation, refused to answer the Guardian's request to take part in the publication’s investigation. 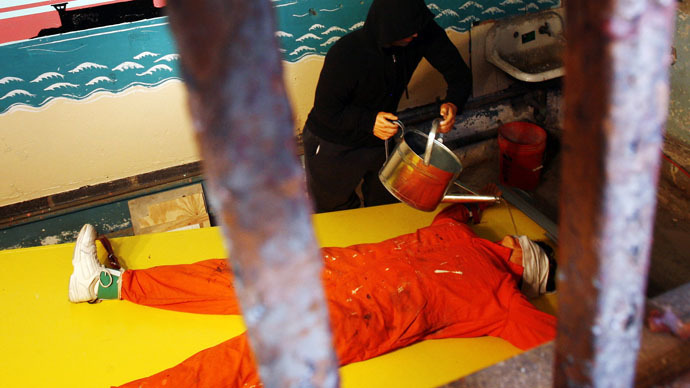 Guantanamo has gained notoriety over the past decade for cruel and inhumane confinement conditions and well-documented use of torture in the camp. President Barack Obama's has pledged to shut down the prison camp but nearly 130 detainees are still being held there.